Blackberry mobile launched its best ever Android supported Smartphones, BlackBerry Priv has touched screen and Qwerty keyboard with other great features.It provides two functionality to BlackBerry user Touch screen and Qwerty keyboard. 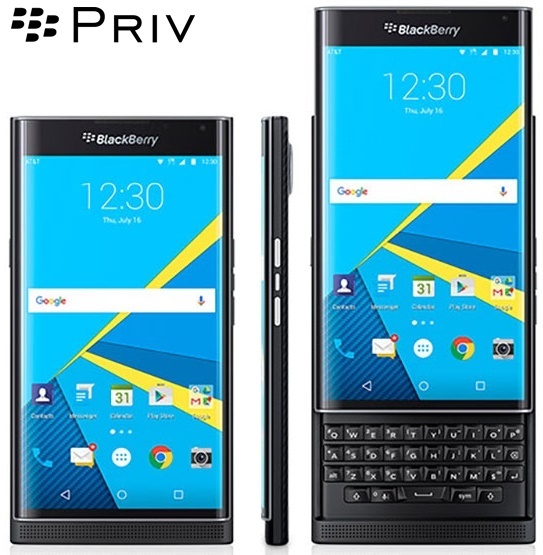 Priv equipped with Android version 5.1.1 (Lollipop) which is later Upgrade able to Version 6.0.1 (Marshmallow) and it has 32 GB Built-in storage and supports MicroSD card up-to 256 GB. If we are talking about its Processor and Ram Blackberry Priv supports all latest Apps and Games available in the Google Playstore. Priv has 1.8 GHz Dual-Core Cortex-A57, 1.44 GHz Quad-Core Cortex-A53, Qualcomm MSM8992 Snapdragon 808 with GPU: Adreno 418 and 3GB RAM. Blackberry Priv supports multi touch up-to 10 fingers on the 5.4 -inches bigger screen surf the website like Pro user on 4G LTE network, use only nano sim slots for GSM, HSPA and LTE. If we are talking about Berry Priv camera it has 18 Mega-Pixel on back side which supports f/2.2, 27mm, Schneider-Kreuznach optics, OIS, phase detection autofocus, dual-LED (dual tone) flash, 1/2.4' sensor size, geo-tagging, touch focus, face detection, HDR, panorama, Video (2160p@30fps, 1080p@60fps). And on front Blackberry Priv supports 2 Mega-Pixel camera with 720 Pixel video recording. Other specifications are GPS+A-GPS supports, Nano Sims, Noise cancellation on mic, fast charging and many more. Blackberry Priv is a masterpiece handset which lying in Ultra-thin design and provides legendary security with hidden Qwerty Keyboard opens through smartSlide Technology. This smartphones best fit to Professional users who used their handset daily 15-20 hours with internet surfing and complete tasks on the go, Priv provides extra large 3410 mAh powerful long lasting non removable battery which supports fast charging 60% on the 30 minute charge. It supports USB 2.0 fully supported with standard microUSB 2.0 cable Cabled-Video Out, 4k @30 fps, supported with standard SlimPort adapter. And supports these image formats only (BMP, GIF, JPG, PNG, WEBP) for video Blackberry Priv supports these formats (3GP, 3G2, AAC, AVI, ADTS, ASF, AWB, DIVX, FLAC, IMY, MID, MKV, MP3, MPEG-4, MXMF, OGG, OTA, RTTTL, RTX, WAV, WEBM, WMV, XMF).